When the Germans scuttled their interned warships at Scapa Flow, Orkney, in June 1919, most people thought that the ships had found their last resting-place. By a series of salvage miracles many of the seventy-two German vessels have now been raised. IN AN EARLY METHOD of salving one of the warships. A local shipowner bought four or five sunken destroyers from the Admiralty and carried them ashore by using two old barges lashed together with baulks of timber. To obtain adequate lifting power, he employed great inflated camels made of canvas. One of these camels is seen on either side of the destroyer in the photograph. STRONGHOLD of the British Navy during the war of 1914-18 and graveyard of the German Navy after the war, Scapa Flow is as lonely a spot as any misanthrope could select to get away from the hurly-burly of city life. Its desolate waters, girt by the treeless islands of the Orkney group, have seen successive miracles of ship-raising since the Germans on that sunny morning of June 21, 1919, scuttled seventy-two of their warships on a signal from their admiral, and destroyed almost all their navy. The general opinion was that the ships were buried for ever at the bottom of Scapa Flow. Even the salvage experts averred that there was little to be done, for salvage men do not go into the business to perform spectacular feats. Their main concern, as with other people, is to make a living, and unless they can see a profit in an enterprise there is nothing to induce them to undertake it. For a year or two the German ships rested undisturbed at the bottom of Scapa Flow, during which time thousands of tons of redundant war material were being cut up and flung into the melting pot. It was not until the prodigious supplies of war material were coming to an end that one or two scrap-metal merchants let their thoughts dwell on the German warships that lay at the bottom of Scapa Flow. A local shipowner in the Orkneys was the first man to attack the problem of the sunken ships. After a critical survey he had the courage to go to the Admiralty and buy four or five of the destroyers, which he carried ashore by using two old barges which were lashed together with baulks of timber. As the barges did not give him all the lifting power he needed, he used some great inflated camels made of canvas. The next man to give serious consideration to the raising of the German warships was Mr. E. H. Cox, a scrap-metal merchant who, having devoted his energies during the war of 1914-18 to changing steel bars into shells, had reversed the process after the war and was now converting old warships into implements of peace. Having bought and cut up the Orion, he acquired a German floating dock in the centre of which was a big cylinder for testing submarines. This was in process of being cut away, when Mr. Petersen, a Danish metal merchant, urged Mr. Cox to try to raise the German ships. To Mr. Cox the proposition looked attractive. The fact that he had never raised a ship in his life and was inexperienced in this kind of work did not deter him. Heedless of the chorus of experts who declared that such an undertaking was foredoomed to failure, he went to the Admiralty and acquired the right to raise twenty-seven of the German warships. Most of these were destroyers, but their number included the battle cruiser Seydlitz, which was lying on her side in Scapa Flow as if she were a stranded whale, and the battle cruiser Hindenburg, which rested on the sea-bed in sixty feet of water with her upper works and guns exposed even at high tide. As so much of these big ships showed above water, they gave the onlooker the impression that they would be easy to raise; but Mr. Cox was later to learn by experience that this impression was erroneous. the heaviest of the German destroyers. Instead of proceeding with his original plan of cutting the dock to pieces, he set his tugs to tow it up to Scapa Flow. This was a slow and laborious journey, because of the dock’s unwieldy nature. The dock walls rose to a considerable height on either side and, when an adverse wind exerted its pressure on this great expanse of steel plating, it was difficult for the tugs to make any progress. The dock was, however, safely towed to Lyness, on the east coast of the Island of Hoy. Here the Admiralty had built barracks and a quay for the Fleet during the war, and here the dock was cut down the centre by oxy-acetylene cutters and divided longitudinally into two halves. Along the cut edges, opposite one another on either side of the dock, Mr. Cox set up a series of powerful double-handed winches. By these he proposed to wind up the destroyers inch by inch until they were suspended far enough from the bottom for him to tow them into shallow water, where he could deal with them. A few months earlier, a new American salvage concern had proposed to lift ships by placing hooks in the port-holes and using pontoons to haul the craft to the surface. The writer prophesied that the method must fail, because the hooks would tear through the skin of the hull, which was not strong enough to support the whole weight of the suspended ship. The method was tried and he was proved to be right. Mr. Cox, seeking the quickest way of lifting the torpedo boats, decided to adopt the same method as the Americans; but a test with one hook, which tore through the plating, soon proved that this idea was not practicable. By now he had spent the huge sum of £43,000 on his preparations. In his desire to curtail further expenditure, he decided to break fresh ground by using chains, instead of steel cables, to lift the ships. He already owned the anchor chains of the Orion, the giant links of which were almost too heavy for one man to lift. As they had been tested to withstand enormous loads, he concluded that they would be strong enough to carry a 600-tons or 800-tons ship for a few miles. 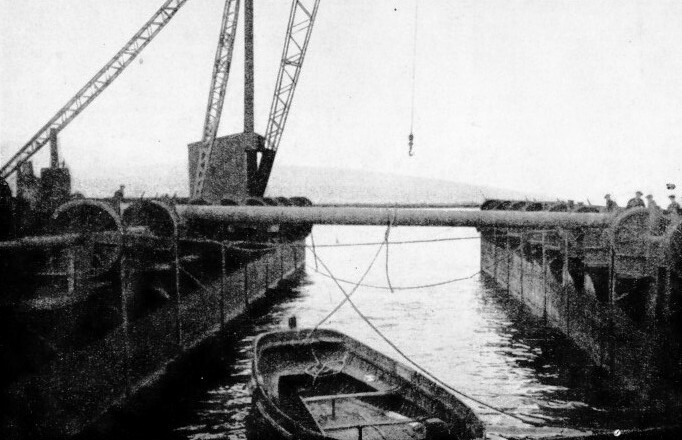 FLOATING DOCK belonging to Mr. E. H. Cox, who raised many of the German warships at Scapa Flow. The dock, in the foreground, has a destroyer suspended in slings below it and is approaching Mill Bay, Hoy, Orkney. This bay was used as a dumping ground for the smaller German craft before they were cut up at Lyness, on the east coast of Hoy. 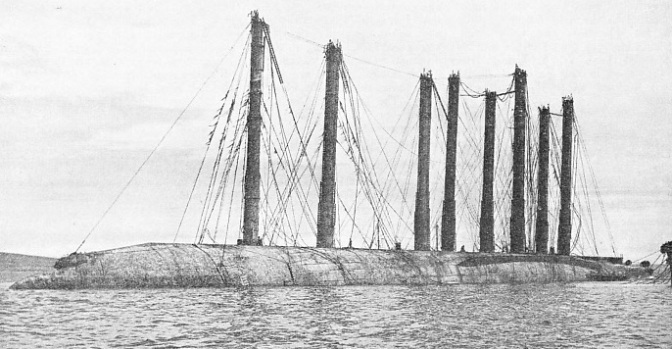 The long rod indicated the height that the wreck had been lifted. Once more his inexperience led him astray. He forgot that although the chains had been made to withstand a great strain, it was impossible to wind their giant links over small pulley wheels and distribute the strain equally over the whole link. To take a parallel instance, two strong men might tug away at either end of a thin bamboo stick indefinitely, without pulling the stick in two, provided that they did not bend it, but one man could snap the same stick across his knees in an instant. Having overlooked this important factor, Mr. Cox got the chains under a destroyer and set his squads to turn the handles of the winches. Directly the full weight of the ship came on the chains, one of the links snapped across a pulley wheel, in the same way as a stick across a man’s knee. As the chain broke, the sudden strain on the next chain snapped that. In a moment links were flying in all directions, dealing such terrific blows on the hollow tanks and steel walls of the dock that the sound in the islands miles away resembled a sudden bombardment of heavy guns. Men shouted and flung themselves flat on the dock; others rushed into the workshops in the dock walls. It seemed certain that one or two must be killed and that several would be badly injured, for there were over a hundred men clustered along the edges of the dock when the links began to snap. By the greatest luck, not a man was injured. The man who was going to make salvage history thanked his lucky star and realized that the salvage men who knew the game were not such fools after all. His labour was costing him £500 a week and he had wasted much money in learning the lesson that chains will not serve the same purpose as wire ropes in salvage work. Having boarded his tug, the Ferrodanks, he pushed her at full speed across the Pentland Firth to Scrabster Harbour on the mainland, two miles north-west of Thurso. From Thurso he hastened to London, where he spent thousands of pounds on fine new steel lifting-ropes. Directly these ropes arrived, Mr. Cox’s divers went down to manoeuvre them under the boat, and gradually got them in place. The men were taken out to the floating dock, where they manned the winches and wound up the German warship. This was beached near Lyness six weeks later. That was no mean accomplishment, but to Mr. Cox it seemed to have taken too long, so he bent his energies to working out a method that would save as much time as possible. Sweeping cables under a ship is generally a lengthy job, and sometimes the divers have to make a tunnel under the keel to pass the cable through. This onerous task Mr. Cox reduced to such simplicity that it seemed child’s play. He passed a cable under the stern, where it was free of all contact with the sea-bed, and set his men to wind up the stern until there was a gap between her keel and the sea-bed along nearly her whole length except the few feet forward where her bow rested on the bottom. Thus at a stroke he avoided the necessity of tunnelling in the sea-bed to pass cables under the keel, and by a most ingenious system of pilot ropes he slipped his cables under the ship without calling on the divers at all. The method was simplicity itself. The first cable that was passed carried with it a light line which, as soon as it appeared, was unlashed from the cable and carried along to the next winch. The other end of the line was made fast to the new cable on the opposite winch, a second pilot line also being attached to the end of the new cable. The first pilot line was then used to wind the new cable under the ship, the new cable bringing with it the second pilot line, which was duly taken along to the next pair of winches, where the process was repeated. So skilled did the men become in this method that they eventually succeeded in passing cables under a vessel in the record time of forty minutes. THE FIRST SUCCESS of Mr. E. H. Cox was a destroyer raised in six weeks. Much experimenting was necessary before the right method was discovered. At first Mr. Cox thought of using hooks, but a test proved them to be unsuitable. Then chains, instead of steel cables, were used, but without success. Finally, with the help of new steel lifting-ropes, the vessel was raised without much further difficulty. Instead of taking six weeks for the second destroyer, they brought the time down to twelve days. Still Mr. Cox was not content. The goal he had in mind was to raise one ship a week. The team work of his men improved to such an extent that they brought home a ship in five days. Then they carried another destroyer ashore in four days. It seemed impossible for men to do more, yet they shattered this record by bringing a ship home in three days from the time they passed the first cable until the moment she was placed ashore - a feat that remains the high-water mark of salvage drive and efficiency. When I went up to watch the work on one of the earliest destroyers, the men were just beginning to settle down to their task. Having gone out to the floating dock, I found the halves joined at either end by two baulks of timber that served as bridges for the men to pass from side to side. Out of sight on the bottom lay the destroyer V 70, with the lifting wires beneath her. The men were lined up on either side by the winches. All bent their backs in unison as they kept time to the voice through the megaphone, a breathing spell coming at the end of the turns. Then the same thing went on again and again all through that sunny morning, while the German ship rose nearer and nearer the surface. The men’s combined strength was lifting a weight of about 700 tons, but they did not trouble their heads over the wonder of it. An iron rod that touched the deck of the wreck was marked to show the level when the operations began. As the rod emerged it was possible to see at a glance how far the men had wound up the ship from the bottom. While the men were winding her up the tide was, of course, lifting her still higher. By utilizing the man-power in addition to the rise of the tide, it became possible to carry the ships ashore in record time. Towards the middle of the afternoon part of the bridge, grotesquely decorated with seaweed, appeared above the surface, and a little later the two tugs fastened on to the two halves of the dock and began to haul them, with the V 70 suspended between them, towards Mill Bay, on the east coast of Hoy, near Lyness. Scarcely any progress seemed to be made, but I found the V 70 safely lodged in Mill Bay the next afternoon. I made my precarious way up the side and clambered on board. There was a strong stench from the sea urchins and seaweeds rotting in the sun. My feet slithered about the decks-over rotting sea growths. The cabin was full of debris - the stuffing from the mattresses in the bunks mixed up with furnishings and crockery in a hopeless tangle. Mr. Petersen, the Danish metal merchant, threw up a little hammer to me where I stood on the bridge. “Just tap round about with that”, he said. I tapped here and there in all directions. From the sounds he told instantly what kind of metal it was without seeing it, and was thus able to give an estimate of the value of the ship that was raised. RAISED AFTER TEN YEARS on the sea-bed, the German battleship Kaiser in 1929. To salve the larger warships, it was found necessary to use compressed air. Air-locks were built and fixed on the ship’s bottom. Ways were cut through the bottom and the air was pumped into compartments in the hull. The air gradually forced down the water-level and enabled the men to seal all pipes and apertures in the hull. At that time the gun-metal torpedo tubes were worth about £100 apiece, and Mr. Cox was surprised to find when he lifted some of the torpedo boats that several of the tubes were missing, although they had been down for years in forty or fifty feet of water. Some enterprising individuals had removed much metal from the German warships. A few of these men had gone out to the Seydlitz, had sunk their boat alongside her so that it would not be seen and lived aboard while they stripped her down to water-level. They took out all the brass, gun-metal and copper and packed it in barrels to represent herrings. Where those barrels went is more than I can tell, but some unofficial salvors did well out of the scuttled ships. On one occasion when Mr. Cox sought a watchman to protect his property from straying, one of the applicants advanced as a reason for being engaged and as a testimonial of his efficiency that he had kept watch for the men who had stripped the ships in secret. My exploration of the upper works of the Hindenburg revealed that all the metal of any value above water had vanished. Electric cable and telephone wiring had gone, switches and lamps were no more, and even the brass screws had been taken out wherever possible. I made my way in the pitch dark up the little iron ladder in the hollow mast until I reached the topmost platform, from which I surveyed the islands all round. Then I went down the dark way again, feeling for each rung with my foot. It was an eerie experience being cooped up in that confined space, and I was not sorry when I reached the deck. In due course the man who had never before raised a ship in his life picked up twenty-five of the German destroyers from the bottom and consigned them to the smelters. “It was just beginning to pay”, he told me, when he came to the end of the small craft. Meanwhile he was puzzling out a way of dealing with the Hindenburg. He considered and rejected the idea of building coffer-dams on her decks and decided to cover in all apertures to make the compartments water-tight, so that he could pump her out and refloat her. His divers went inside the ship and sealed up the holes. Wooden moulds were fitted over deck openings and filled with rapid-hardening cement. The huge sum of £30,000 was spent on preliminaries, and then the plan was put into operation. The pumps began their battle with the sea and the Hindenburg began to show signs of life. As she began to move, however, Mr. Cox noticed a tendency to list which made him call a halt. Having filled one of his destroyers with cement, he drove her inshore and sank her. Then he fixed some 6-in. steel cables to the masts of the Hindenburg and carried them across to the destroyer, to which they were made taut in the hope that they would prevent the battle cruiser from heeling over. Once more pumping operations began. The water gushed out and the Hindenburg began to rise, listing as she came until her great weight on the 6-in. steel cables snapped them as if they were threads. She canted at a most alarming angle, but Mr. Cox kept the pumps going in the hope that she would come up and resume a normal and relatively safe position. Mr. T. McKenzie, the Chief Salvage Officer, eyed her doubtfully. If the massive ship suddenly overturned incalculable disaster might ensue. “Get the men off the dock,” said Mr. Cox, and the dock was cleared. Then for a time pumping continued, but the Hindenburg heeled so acutely and the prospect of raising her if she overturned presented such a complex problem that he decided to let her sink again. It was a profound disappointment that cut deeply into his financial resources. Finances were reorganized, and a fresh assault was planned on the sunken ships. Mr. Cox left the Hindenburg until later, and turned his attention to the battle cruiser Moltke. She was upside down and totally submerged, but he concluded that if the K 13 could be raised by compressed air and if the Italians could refloat the Leonardo da Vinci on air, it should be possible to refloat the Moltke by the same means. THE BATTLE CRUISER HINDENBURG appeared easy to raise as, although she rested on the sea-bed in 60 feet of water, her upper works and guns were exposed even at high tide. But three unsuccessful attempts were made and the sum of £50,000 was spent before she was refloated. When the Hindenburg was inspected it was found that all the metal of any value above water had been removed. Mr. Cox built some air-locks and instructed his divers to bolt them into place in certain positions on the bottom of the Moltke. Ways were cut through the bottom of the ship and the air compressors pumped air steadily into one compartment. As the belt of air gathered in the top of this compartment it gradually forced the level of the water down low enough to enable men to work there and stop all pipes and apertures, as explained in the chapter on the Leonardo da Vinci. After months of work enough compressed air was driven into the Moltke to bring her up to the surface. She was towed to the depot at Lyness, where further adjustments were made to enable her to be towed round to the Firth of Forth to be broken up. Having performed a notable salvage feat and won his first big ship by the use of compressed air, Mr. Cox decided to refloat the Seydlitz by the same method. As we know, she was lying on her side and, so far as he could see, there was no reason why he should not be able to float her in this position. He concluded that if he stripped the valuable armour-plate above water, he would be able to lessen the weight to be lifted as well as lighten his own financial burden. The armour-plate could be sold in the United States at a good price and the money would help to pay the cost of salving the warship. Once the armour-plate was removed, her inner hull would be exposed along her whole length, and this would serve to contain the compressed air and refloat her. He could see no flaw in his plan. The armour-plate was peeled off and shipped to eager buyers on the other side of the Atlantic. By the time the side of the Seydlitz was stripped they had shipped 1,800 tons of armour-plate. One or two wooden houses were built in the ship for the use of the divers and to serve as stores. The air-locks were fitted and once more the salvage squads passed in and out of the ship under compressed air, fighting for months to stop all apertures and to make the vessel air-tight down to a certain level. 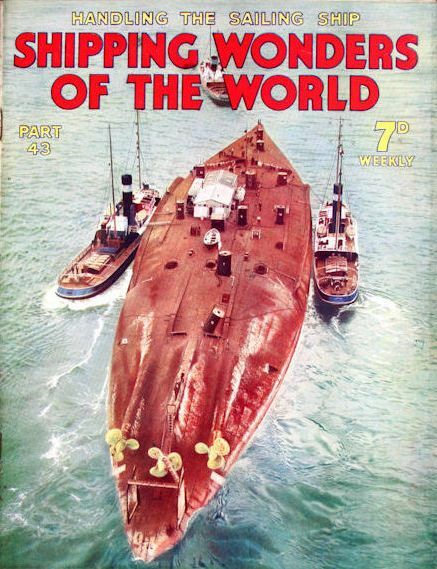 The cover of Part 43 shows the old German Dreadnought Kaiserin on her way to Rosyth for breaking up. The picture was taken from the Forth Bridge as she passed underneath it. Directly the job was finished, Mr. Cox began to pump air into the Seydlitz to float her off the bottom. She began to move but she showed a strong tendency to turn over. The explanation was perfectly simple. As she sank she was turning upside down when her funnels, masts and guns came into contact with the sea bed and stopped her. If there had been a greater depth of water she would have completed the semicircle. 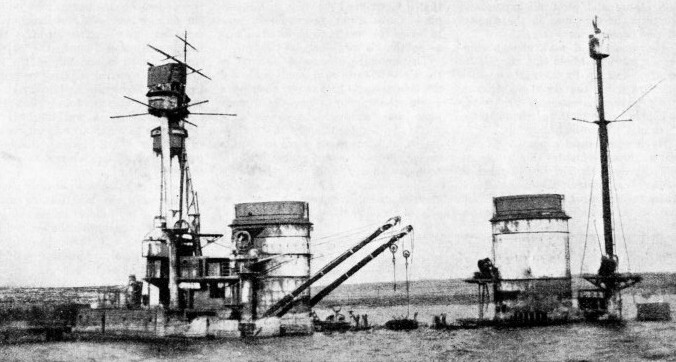 As soon as the compressed air began to float the Seydlitz towards the surface, the great weight of her top-hamper - turrets, guns, funnels and masts - sticking out to the side, unbalanced her and the law of gravity tended to carry this weight to the lowest point, thus swinging her upside down. Mr. Cox fought hard to prevent this. He brought his two halves of the floating dock on the scene and moored them tightly alongside, to try to prevent her from turning. He half filled a destroyer with concrete and fixed the mass on her keel in the hope that it would balance the weight on the opposite side. He did not know whether his effort would succeed or fail. Then one afternoon the position grew so ominous that he ordered all the men out of the ship at once. They came swarming from the air-locks amid the shrieking of the compressed air. Once more Mr. Cox thanked his lucky star, for suddenly the battle cruiser swung right over, tearing the bollards out of the sides of the floating docks, snapping the great 9-in. steel cables as though they were spiders’ webs, and came to rest upside down, with the air-locks and other structures completely under water. SALVED IN FOURTEEN DAYS, the German destroyer S 55. After the raising of the first vessel - which took six weeks - the team work improved so much that eventually the salvors brought one destroyer ashore in five, another in four and yet another in three days. Although the S 55 had lain for five years in 40 feet of water, it was found that two of her valuable torpedo tubes had mysteriously vanished. The work of months was swept away that afternoon, but Mr. Cox refused to be cast down. He refixed the air-locks in the bottom of the ship and, after a gigantic struggle, floated her and towed her to the depot at Lyness. 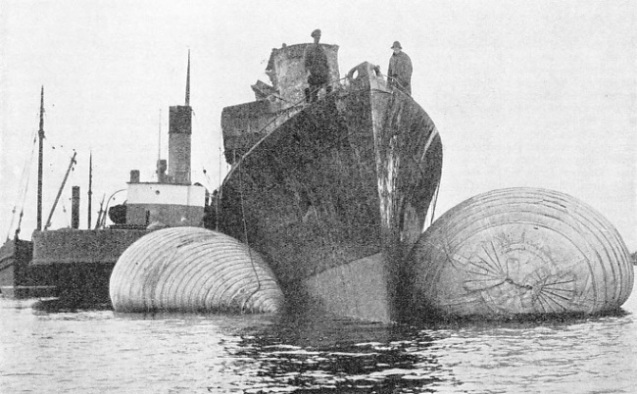 The removal of the 1,800 tons of armour from her side had unbalanced her. I shall never forget watching his men toiling on the shore at Lyness filling sacks with shingle. For every ton of armour-plate he took off her side he had to load a ton of shingle into her to balance her on the voyage round to the Firth of Forth. His salvage squads became so used to working under compressed air, and passed in and out of the air-locks so easily, that it was hard to appreciate the unusual conditions in which they worked. Yet going through the airlocks into one of the submerged ships was somewhat of an ordeal, as I soon discovered when I went to explore the battleship Kaiser in the early months of 1929 a few days before she was ready for refloating. “It will be all right if your heart is sound,” Mr. Cox told me. Having followed my guide up the little iron ladder on the outside of the air-lock, I waited on the top while he struck four heavy blows with a hammer to inform those within that we wished to enter. In a minute or two the air began to shriek from a valve as it escaped from the inside of the lock and lowered the air pressure there to the pressure of the outer air. Directly the noise died away, the heavy door on top of the lock dropped inward, and I climbed down the iron ladder as though I were entering a submarine conning-tower. It was impossible for a man to push that door open when the air-lock was full of compressed air; the pressure was too great for the strength of a man to overcome it. The door was swung upwards into place and held until the air pressure shut it securely. Another valve was turned and pandemonium broke loose. It seemed that all the railway engines in the world were letting off steam at once. The interior of the lock grew thick as a London fog as the compressed air gushed into it through the pipe from the interior of the ship. “Let me know if you feel ill and we will go out,” said my guide. The shrieking of the air continued. The fog grew thicker. I swallowed desperately to adjust the pressure inside my eardrums with the increasing pressure of the lock. Presently, I thought, my head would be crushed in. Another novitiate of the air-lock gazed at me with a hunted look, and I knew exactly what he was going through. I swallowed hard to keep the pressures adjusted. Meanwhile I watched the needle on the air-pressure dial swing round until the shrieking noise subsided and I knew the ordeal was over and that the pressure inside the lock was the same as that inside the sunken Kaiser. The round trap leading into the interior of the ship dropped downwards, and far below I saw what appeared to be a sea of black ink lit by electricity. I felt with my feet for the first rung of the iron ladder that was tucked away out of sight and climbed down. The litter was indescribable. Red rust bit into the metal in all directions. Coal dust and oil covered everything. The filth had turned the sea inside the ship as black as ink. Having climbed down innumerable ladders, through holes cut into the plating, I reached the topsy-turvy stokehold. Furnaces were upside down, red ash was spilt all over the place, shovels and rakes lay in confusion. Over my head were the floors of the ship, beneath my feet the ceilings. I made my way gingerly to the engine-room, when my feet knocked against the lamps that used to illuminate the warship. I reached down to the ceiling underfoot and wrenched one lamp away to serve as a souvenir and a desk lamp. After ten years on the sea-bed a mere trace of water had percolated into the outer glass and the electric bulb was still capable of being lit. EIGHT AIR-LOCKS, each weighing twenty-five tons, were secured by steel ropes to the bottom of the German battleship Konig Albert before she could be refloated. She lay in deep water, her stern being 126 feet and her bow 133 feet below the surface. The ship’s bottom was divided into six sections, each made air-tight. The work was begun in November 1934 and the battleship was raised, after eight months’ work, in July 1935. On April 29, 1936, the Konig Albert left Scapa Flow for Rosyth Dockyard to be broken up. an opening bn my right. “I wouldn't go any farther if I were you. There’s forty feet of water there,” said a voice. I looked at the light reflecting evilly in the blackness and turned tail. “Mind how you go. You are walking on a pipe there,” said my guide. Had I slipped off in that passage I should have dropped up to the armpits in water. Only those who have watched the work can appreciate the difficulty of correctly balancing an overturned battleship to bring her to the surface without a list. The air compressors may work for days pumping in air. Then, instead of the ship coming up, she may just push up her bow. to spill unknown quantities of the air that has been pumped into her, leaving the heavily weighted stern still resting on the bottom In this event it may be necessary to allow the air, or the greater volume of it, to escape by the valves from the bow to let that down again, while the compressors concentrate on the after compartments to raise the pressure until it is sufficient to lift the extra weight at the stern. When a ship comes up slowly, it is amusing to watch the gulls settling down in search of food. I saw one gull pick up a huge mussel and drop it five times in the Kaiser to break the shell and get at the contents. Each time the mussel dropped, a lazy bird tried to get at it before the owner could settle. A young seal kept bobbing up close by as if curious to see what was going on. The salvage squads are so used to these things that they take no notice of them. The herons meditating in the shallows or the cormorants spreading their wings to dry arouse no more comment than a bus in a city. One day the divers received a shock when three whales began to chase their tails round the diving boat. The tail of a whale entangled in the diver’s lines might have brought serious consequences. As the divers were not anxious to be taken for a ride by a startled whale, they suspended operations until the whales went to play elsewhere. Before the Seydlitz could be towed round to the Firth of Forth to be broken up, it was essential to cut away a turret to enable her to enter the dock. The Moltke had only about seven inches clearance at high tide, but cutting away the turret of the Seydlitz gave her six or seven feet clearance. To cut the turret took the men six weeks, and they were obliged to work in masks to avoid the fumes. For months the vessel floated on compressed air beside the dock at Lyness, and when I went through the air-lock to examine her she was in a sorry state. Down in the engine-room the great turbines hung from a few bolts overhead. I wondered if the bolts, which had been so long on the sea-bed, would give out while I was underneath. Pipes, great and small, made their sinuous ways in all directions. The way the condenser tubes had been ripped out to just below water-level showed the looting that had taken place. THE TWO HALVES of the floating dock were joined by baulks of timber that served as bridges for the men to pass from side to side. Mr. Cox had the dock divided longitudinally by oxy-acetylene cutters. Along the cut edges, opposite one another on either side of the dock, was placed a series of powerful winches. 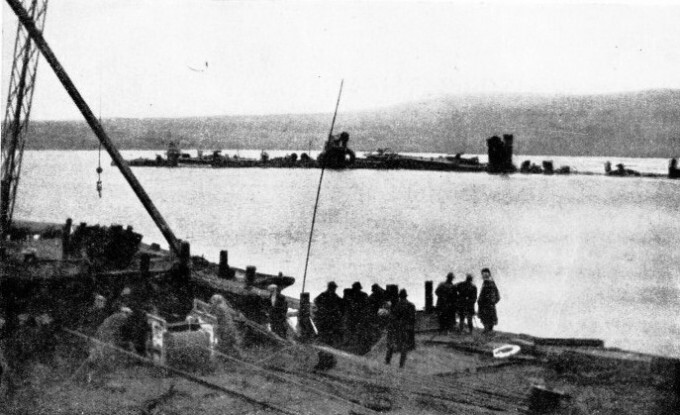 The dock was manoeuvred over a sunken destroyer and cables placed under the vessel wound her up until she was far enough from the sea-bed for the salvors to tow her into shallow water. I made my way down numerous ladders until I reached the turret. Having squeezed between the outer and the inner skin, I washed the filth from my sea-boots at the bottom of Scapa Flow. I could have touched the sea-bed with a stick. Above my head lay forty feet of water. There was no visible barrier to keep the sea out of the ship - just a belt of air compressed to eighteen pounds to the square inch. If one of the air-locks had been suddenly destroyed, the air would have gushed from the ship and the sea would inevitably have overwhelmed me in an instant. It, is impossible here to touch on a tithe of the adventures and misadventures that took place while the salvage work was in progress. But it is good to know that Mr. Cox, after having spent another fortune to make two further attempts on the Hindenburg, managed at the fourth attempt to raise her and tow her round to Rosyth. Wonderful as was the work Mr. Cox performed, his Chief Salvage Officer, Mr. T. McKenzie, has since achieved even greater successes on behalf of Metal Industries, Ltd., the company that bought so many of the German ships when they were raised. 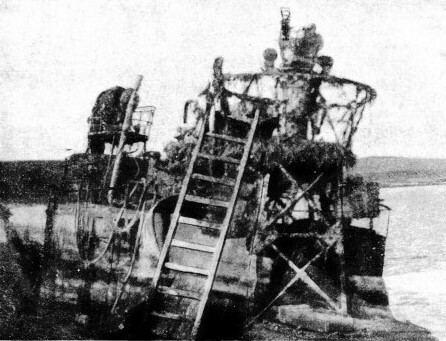 At the time that Mr. Cox withdrew from Scapa Flow and dispersed his salvage plant, it looked as though the last of the German ships had been raised. Those which remained were in so great a depth of water that they seemed too difficult and dangerous to salve. 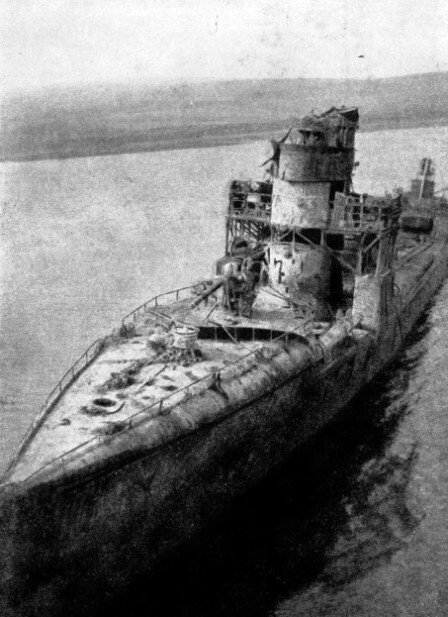 But Mr. McKenzie, who had been Chief Salvage Officer at Scapa Flow since the beginning, was inured to difficulties, and he concluded that it was not beyond his skill to raise the Bayern. This battleship of 28,000 tons, the heaviest ship ever tackled, lay in 125 feet of water. The longest air-locks ever seen, from eighty to a hundred feet long, were built and towed out to the overturned ship. These huge locks, which resembled factory chimneys, had to be manoeuvred into their correct places on the bottom of the ship. There they were held while the divers drilled holes to correspond with the holes in the flanges of the locks to bolt them into place. Steel ropes had to be fixed at intervals down the sides of the locks and stretched taut to different parts of the ship to hold the locks securely against the battering of the seas. Then the water was driven from them by compressed air, and apertures were cut through the bottom of the ship to let the salvage men in and out. Eight months of hard toil, cutting and sealing the pipes and stopping the apertures with concrete patches, saw the work completed to Mr. McKenzie’s satisfaction. Millions of cubic feet of air were pumped into the Bayern’s compartments. While the compressors were still busy she unexpectedly broke free from the bottom and floated to the surface, where she rolled for a while as the escaping air threw up great fountains all round her. Then, as she lost her buoyancy, she slowly sank beneath the surface once more. Mr. McKenzie did not worry. He had proof that he could raise her. This task he accomplished successfully some three weeks later, in September 1934. Having raised the heaviest ship from the record depth of 125 feet, Mr. McKenzie set out to raise the battleship Konig Albert, which lay slightly deeper, her stern being in 126 feet of water and her bow in 138 feet. One morning in November 1934, the tugs could be seen towing the lattice-work crane from which was suspended a 100-ft. air-lock weighing twenty-five tons. The hazardous task of placing it in position was intensified by a choppy sea, but it was bolted down on November 29, and in a few days some twenty steel wires secured it firmly. In all there were eight of these giant air-locks fixed to the bottom of the battleship, which was divided up into six sections, each of which was worked on in turn and tested to see that it was air-tight. On Friday, July 26, 1935, after eight months of toil, he put the work to the test, driving air into the main section to lift the bow. If, when the bow came up, she developed a list, he proposed to correct it, and then lift the stern. Unhappily a gale next day forced one of the salvage steamers to seek shelter. It raged all Saturday and Sunday and did not abate until Monday evening. By ten o’clock on the Tuesday morning, the tugs were pumping air into the wreck to their fullest capacity. About one o’clock her bow broke from the bottom and in half a minute swung twenty feet above the surface, amid gigantic fountains of oil and spray that shot a hundred feet in the air. The sea boiled round her as the compressed air expanded and escaped from the bow of the ship. With twenty-two air lines entering the ship, the salvage officer was able to control the air going into the various compartments, varying the pressures to his needs. By three o’clock in the afternoon Mr. McKenzie concentrated on driving air into the three stern compartments. The air pumps worked steadily all through the night. At 9.55 the next morning the stern gave signs of rising. At once the signal was given to stand by. In five minutes the stern of the great ship swung with a rush to the surface, in a most spectacular turmoil of spray, while the bow dipped and looked for a moment as if it would sink to the bottom again. The risk had been foreseen and was quickly countered by driving huge volumes of air into the forward compartment. By midday the keel of the Konig Albert floated fourteen feet above the surface of the sea with her air-locks pointing straight to the sky to signify the greatest triumph of ship-raising so far performed. On April 29, 1936, the Konig Albert left Scapa Flow for Rosyth Dockyard, in the Firth of Forth. On May 14, 1936, the German battleship Kaiserin was raised by the Scottish salvage officer. Scapa Flow has thus seen a succession of salvage miracles. OVERGROWN WITH SEAWEED. 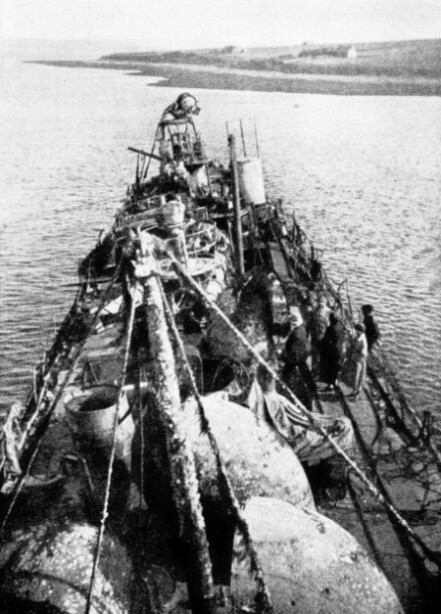 The upper works of a German destroyer as she appeared after her long immersion in the waters of Scapa Flow. Moving about the salved vessel was difficult because of the presence of slippery sea growths. As soon as a ship rose to the surface, watchful gulls settled in search of mussels and other food. You can read more on “Raising a 24,000 Tons Ship”, “The Shipbreaking Industry” and “Surrender of the German Fleet” on this website.